I broke out the new journals the other day, one for each of my kids. My kids love having journals and the excitement of a brand new, blank journal and a whole lot of art and writing supplies were just the thing for a cold, wet weekend afternoon. Our kids always have a journal laying around somewhere, and I always have a supply of new ones in the cupboard so there is always a blank page ready to be filled. Their journals are not strictly for writing, nor are they purely for art…. they are a combination of both and more. They are place to keep your ideas, to experiment, to collect, to share and to be inspired. My kids are constantly drawing something and before we started our journals we would go through ream after ream of paper, and then find all those papers scattered around the house. Now, when they are looking for something to draw on they reach for their journals (with occasional reminders) and all those papers are no longer hiding under the couch, nor are precious drawings accidentally ending up in the rubbish bin. A feather, an interesting leaf, a flower to press, a collection of apple stickers, a stamp, a postcard… now all of these random things that my kids LOVE to collect and keep have a home. In a bid to keep clutter under control I am learning that we don’t have to keep every journal forever, but we do keep them until the end of the year and then go through and either remove any special pages we want to frame or keep, or choose to keep one or two entire journals for a little longer. (I have a couple stashed away in a box I admit) It is one of our favourite things to look through the journals and look back on what they were interested in at the start of the year, how their writing has improved, or their drawings changed. While my big kids have all taken to reading like ducks to water, learning to write has not been so easy for them. Morgan needs to get his pencil grasp right and the girls have long struggled with letter reversal and not writing as neatly as they would like to. I choose not to force them to practice boring writing exercises too often, instead I use their journals to encourage and inspire them to write. And Noah, who is three and not ready to learn to write quite yet, loves copying his older siblings, using letter stickers and stamps, and making letter-like marks which are all pre-writing skills that will stand him in good stead for when he is ready to write. Letters – sometimes I sneak in and steal one of my older kids journals. write them a letter, and leave the journal on their pillow. Then they will write back and leave it on my pillow. First Liners – Izzy’s clever teacher has his whole class in love with this writing prompt and all my kids love it when I write a first (crazy) line to a story in their journals, or they write one for each other, and they have to finish the story. Lists- I write the heading eg “Things I love to eat” and they do the rest. Questions – What super power would you like to have? What would happen if horses could fly? Beginnings of a Drawing – I draw one small item then write a question eg A hat – who wears this hat? They draw the rest of the picture and write about it. Sometimes the journaling happens quietly, on their own, sometimes it is a major creative event with the table piled high with supplies. Old photos, magazines, printable resources. 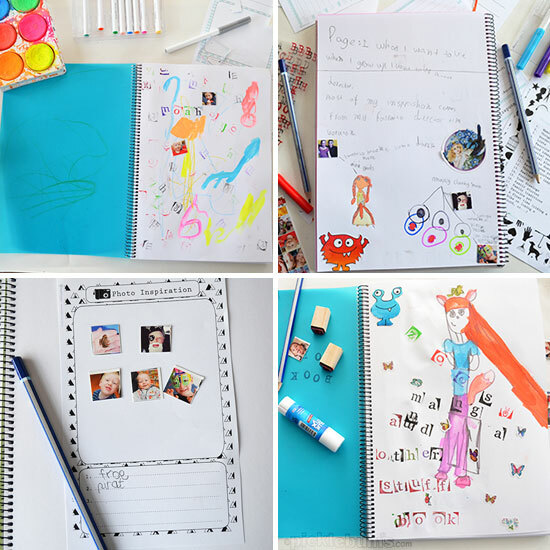 Do your kids have journals? Or maybe you how one? Beautiful post, this happens at our house too! My girls love making journals and keep them in their desks until they are filled and they can go on the bookshelf. I love flicking through them and seeing what they’ve created. Great photos, I am going to add letter stamps to our writing shelf now. The letter stamps are new in our house and we just LOVE them! I just showed my daughter this post and she wants me to go out and buy a journal today, thanks for the awesome idea. Wow this is awesome thank you for the inspiration. 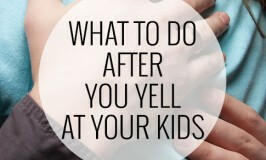 My daughter is 4 is would love to be guided to do this. And I will treasure them all as she grows! Thanks for this. All three of my kids struggle with writing. One can’t stand the feel of the writing utensil in his hand. the other just gets frustrated and the oldest, she struggles with getting the words out of her brain and on to paper. Journaling will make it fun for all three. Love your ideas! My girls struggle with getting their big ideas down on paper too. Journaling lets them just write without worrying about their letter reversals and spelling which I think is so freeing for them. I love this idea… thank you! 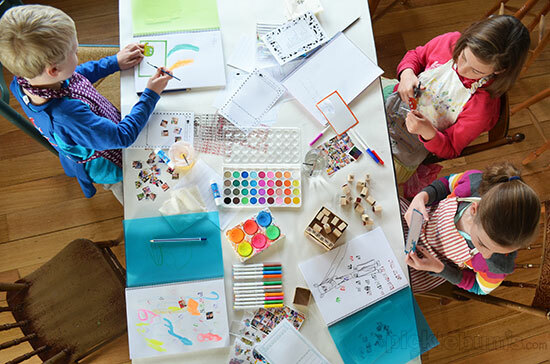 I love this idea….my kids love artwork and creating masterpieces, and we always have the bits of paper all over the house so I think this is a brilliant idea to keep it all together! I do love a journal. My Lulu has a couple. We printed off a list of 100 writing prompts I found on line. She loves scrolling through them and then writing a short story based on this prompt. We also stick photos in with washi tape and write about those. So so sweet. I love your journaling supplies! Are those stickers of your family? They remind me of a project I did a few years ago– face stickers for our nieces and nephews with a homemade coloring book to draw bodies and hairstyles around their stickers. What company did you use to print yours, or did you print them at home? The tiny family photos are actually from leftover Christmas postcards we made last year. 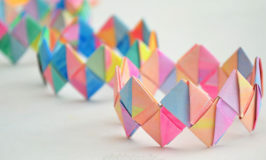 We had quite a few left over and they have been so much fun for creating with. I think it really depends on the child. At 2.5 my Noah wasn’t really interested in drawing or making marks etc at all, but he had his own journal because his older brother and sisters did and he wanted to do what they were doing. At a little over 3 he now drags out his journal on his own because he has recently become super interested in drawing and fills page after page with pictures. So I think whenever they show an interest in drawing or making marks or collecting things, that would be a lovely time to introduce a journal. This is really inspiring. I love Mariah’s lessons and love seeing them be used even more! What I like about journaling is the fact that it can be adapted for pre-writers and readers. It’s such a meaningful practice that is a bit of a lost art. What kind of journal do you recommend? It seems like there are so many sizes and types, I want to make sure it is as child friendly as possible! Where did you find the actual journals? We have lined journals, but I think the plain pages might speak to my 4 year old. Thanks! Or if you are in Australia you can buy them at most Big W stores. 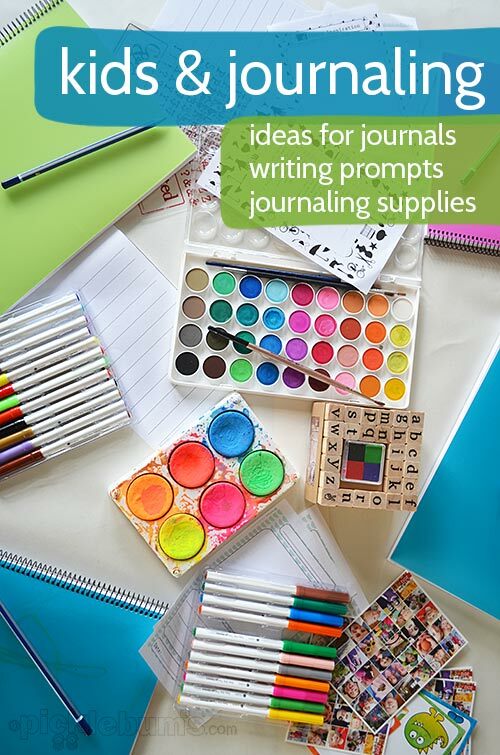 I love your ideas for journaling, particularly the letters and list topics. Thanks for the inspiration! This is so timely for me. I’ve just decided this year to have the older kids do journaling to encourage them to write more. I hadn’t thought to give them the freedom/creativity to draw in there too. I’ve created a “Journal Jar” of writing prompts, but hadn’t thought to add to that some of your fun ideas like “first line”, or a letter to them. What great ideas! I really want to make journaling fun and enjoyable for them and not just a “chore”. I personally love to journal and hope to pass that on to them. Thanks for your post! Found this through the Crafty Crow. Thanks so much; great ideas! Any advice on getting a 13 year old boy into this? I would love to do it with him & think it would be very helpful in so many ways. I wonder if you found a way to incorporate something you already know he is interested in with the journaling if that would help? So maybe if he is into a specific sport or computer game, get him writing down stats or scores or things about players/characters? Collect some images (google and print) that relate for him to use? I’ve also had a lot of success using my older girls’ journals as letter books… so I will write a letter, or draw an image or make a cartoon with a funny joke in their journal and then leave it on their bed for them to find, and then they will write or draw something back to me. Hope that helps! Would love to hear how you go! I love these great ideas. My oldest, 7 yr old, loves to write, but has a challenging time getting the words out the way she wants them (spelling mostly, but ideas too). We’ve used a few of the notebooks that have have a page for drawing and half for writing, but I’ve been thinking of getting her just blank pages so she has more freedom to do whatever with the pages. Thanks for the inspiration. 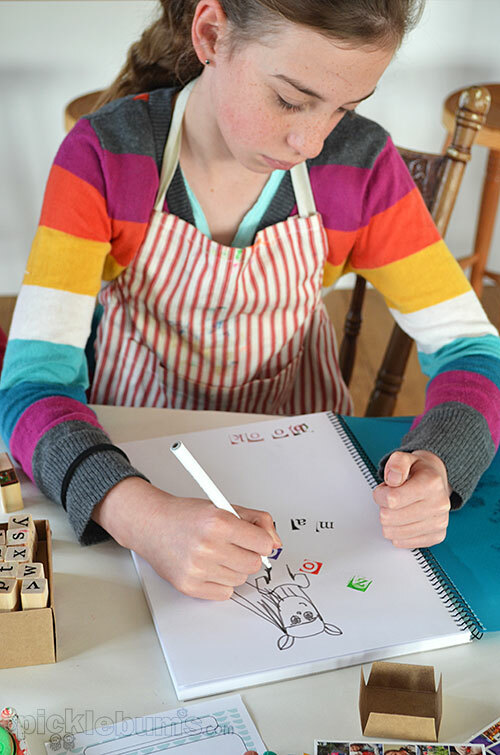 My girls are also often frustrated by not being able to get their ideas on to paper (due to spelling and writing issues), and they have loved trying a more comic book style with short snippets of speech bubble text and lots of pictures… and once they get started they always end up writing heaps anyway! I totally forgot about speech bubbles! (Something my daughter did in school about a year ago and loved.) Thanks for the reminder and encouragement!!! Last night I let her stay up 30 min later than usual and we both wrote in our journals during that time. She was really focused and wrote a couple of pages (she doesn’t take staying up late for granted :)). I printed out some photos of what we did that day (she’s on winter break) and she glued those in her journal after writing about it. It was fantastic! Your post has helped us out already! Thank you! I absolutely love this idea. Our two boys, especially the oldest, is in a robot drawing phase. Where all he does is draw robots. It’s awesome. And they all need to be on the fridge for display. But with this notebook idea of yours, I came up with my own little twist. I do think I’m gonna get a notebook with thick paper, no lines, to make sure the markers don’t press through to the next page. And with pictures and washi tape (love that stuff) we can personalize the front to keep them apart. Thank you for this idea! I love it!